On the World Wetland Day on Saturday, the State government, forest officials and the environmental experts, have emphasised the need to restore Pallikaranai wetland. CHENNAI: It’s shocking. 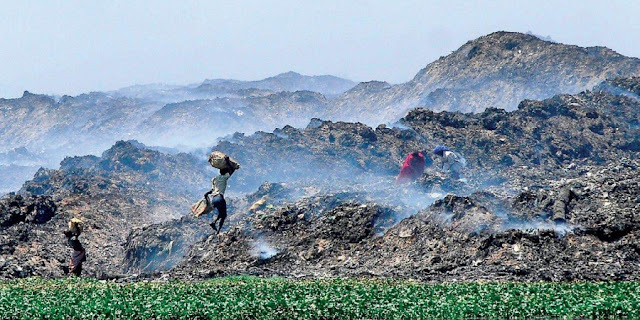 Pallikaranai wetland, which is supposed to act as a carbon sink, is emitting a whopping 8.4 gigatonnes of methane every year, reveals a study conducted by Anna University researchers. Among several factors, the main source of methane is the five-decade-old dump yard and this establishes the fact as to why it catches fire often. The research study was carried out by A Ramachandran, former director, Centre for Climate Change and Adaptation Research, Anna University. “Currently, the wetland is acting as a carbon source rather than carbon sink. Our research shows carbon dioxide emission is 18.4 gigatonnes per year, and the carbon sinking rate is a negligible 0.0020 gigatonnes per year,” Ramachandran told Express on the sidelines of an event organised by the forest department, Department of Environment and Tamil Nadu Pollution Control Board (TNPCB). Ramachandran said, more than carbon dioxide, the emission of 8.4 gigatonnes of methane annually is problematic. Every molecule of methane that gets released into the atmosphere stays there for a minimum of 12 years. Methane is a potent greenhouse gas and is a cause for major concern globally. The study shows that a high concentration of methane is observed during summer and the emissions are lowest during north-east monsoon. Ramachandran said during summer months, when water temperature is 32 degrees Celsius, microbial decomposition intensifies. “Low water levels, higher temperature and high concentration of organic matter allow the sediment to be more anoxic and intensify methane production. During monsoon, the height of water restricts the transfer of methane from subsurface to the atmosphere, resulting in decrease in methane rates,” the study says. Researchers installed flex towers at select locations of Pallikaranai wetland and calculated hourly emissions of carbon dioxide and methane for close to one year. Realising the need for conservation of Pallikaranai, the State government has announced eco-restoration of 695 hectares of Pallikaranai, undertaken under the National Adaptation Fund for Climate Change. The State has also made a budgetary allocation of `25 crore as seed money. Also, Pallikaranai is among the 11 wetlands in Tamil Nadu chosen under the five-year National Action Plan for Conservation of Migratory Birds and their Habitats along Central Asia Flyway (2018-2023). Also, the Forest department is pushing to declare Pallikaranai as ‘Ramsar Site’. Sources in the department told Express that a proposal has already been submitted and is under the active consideration of the Central government. The Ramsar Convention is an intergovernmental treaty that embodies the commitments of its member countries to maintain the ecological character of their wetlands of international importance and to plan for the wise use or sustainable use of all the wetlands in their territories. Pallikaranai wetland is a very unique ecosystem and consists of various habitat types like open water, islands, shallow waters and mudflats, each serving a specific purpose. For instance, open water pockets attract diving waterbirds, while islands and mounds are used as breeding sites for a number of species that nest on the ground. Shallow waters and mud flats are rich feeding areas for a range of migratory waders who probe the water and flats for tiny animals. Larger waterbirds with long legs and bills such as the egret, pelican, heron, flamingo etc., can be found in the shallows probing, spearing, sieving and scooping for food. 6,000 ha to 690 ha. The marsh covered an area of 6,000 hectares in the 1900s, of which there has been a 90 per cent loss of habitat resulting in the presence of only 690 hectares of marsh currently. The Care Earth Trust document blames the fragmentation of habitat on construction of institutes like National Institute of Ocean Technology (NIOT), Centre for Wind Energy Technology and the Perungudi dumpyard and Sewage treatment plant, which occupy a major part of marsh land. Development of IT corridors and residential complexes too took a huge toll. Pallikaranai is one of the 94 wetlands identified under National Wetland Conservation and Management Programme (NWCMP) of the Government of India and is also one of the three in the state of Tamil Nadu, the other two being Point Calimere and Kazhuveli. The number of bird species sighted in the wetland is significantly higher than the number at Vedanthangal birds sanctuary.